Even though he was born in an ordinary family having no spiritual background or heritage, the achievement of His Holiness Avadhut Shree Gurudevananda Swamiji of Ananda Heritage is impressive. Being a common man, he has treaded the path of success with determination which cannot be achieved by just anyone. 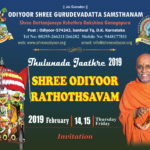 The very soul of the Odiyooru Shree Gurudevadatta Samsthanam is His Holiness Odiyooru Shree who founded it in his hometown. Through yogic success, worship of divinity and community service, the holy seer has been guiding the people towards salvation. Charismatic attitude, inspiring words, compassionate heart, are parts of his revered personality. Hence people from within and beyond the samsthanam long every day for his soothing words and blessings. The name ‘Vadiyara Gutthu’ is mentioned in an epigraph issued by the king Narasimharasa Domba Heggade of Vitla in 1759 AD. This is a historical proof provided by this dynasty. Some invaluable information of the legendary background of this region was revealed during a ‘Swarna Prashna’ session held in Shree Samsthanam on 19-11-2001. The origin of the Shree Samsthanam was a mystery in the beginning of creation. For many ages, the sacred rites were being conducted for the welfare of people. Shri Samsthanam is under the rule of a self-existence naga deva. This region had ponds and lakes; western part had fertile farming land. This region was enclosed by beautiful hills. In ancient times, this region was full of pious people. In krita and treta eras, Shri Samsthanam was at the peak of its fame. However, in kali era, the demonic people captured this region by throwing the ascetics out. It is a known fact that in treta era, Shri Anjaneya Swami went to north to get the Sanjivini Herb. However, because of the inability to recognize the herb, he carried the entire Chandra Drona Mountain and travelled back. During his flight, he entered this region and he was obstructed by the demonic people. He terminated those people and this region again was filled with the ascetics. The act of nullifying the arrogance of demonic people brought the present name – Odiyooru – to this region, as the information was revealed. It was also revealed that a part of Chandra Drona Mountain has been merged with this region. This is the reason why the Holy Seer decided to build the ‘Moolika Vana’ (garden of herbs). Another important fact which was revealed is that the origin of this place is embedded in creation. To the ascetics, this place is a divine inspiration. In treta era, vestals lived in this region. Thus this fact supports the decision of the revered Seer in initiating the renunciation for women. We can observe the link that connects the facts, the 64 vestals serving Guru, as a result gurudev bestowing them with Shri Annapoorna, and the Shree Samsthanam conducting the meal service every day. The divine spirit residing in this region has been guiding the people in conducting the satsanga (good company of people), Purana Shravana (grasping the essence of legends), worshipping of arts, contribution to literature, and spiritual campaign. In this samsthanam, the utmost importance is given to the divine knowledge, wise men and spreading of the knowledge.